For the past two seasons, no player has provided a better surplus value than Evan Longoria. In that span he produced 14.2 WAR, which was second to only Albert Pujols among all MLB players. Considering he made just $1.5 million in those two years, he clearly becomes the team-friendliest player in the league. That probably won’t be the case this year. 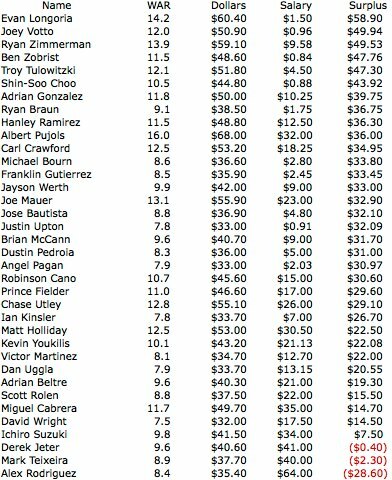 While Longoria will earn only $2 million in 2011, there are a number of younger players who could make a quarter, or less, of what Longoria will earn and could turn in similar numbers. To start, here’s a list of every player in the majors who produced 7.5 or more WAR over the last two seasons, along with their WAR Dollars, actual salaries, and the difference. Though Joey Votto earned less, Longoria still provided $9 million in additional surplus value for the Rays. For the new surplus producers, I have two zero-to-two names in mind. These two far outpaced their salaries in 2010, and figure to do so again in 2011. The best part about these two is that they won’t even be arbitration eligible after this season. I’m willing to bet that when we look back on 2010 through 2012, these two players will have the highest surplus values in the league. McCutchen featured prominently in yesterday’s season preview for the Pirates. In it I said that McCutchen could prove him as the best center fielder in the bigs this season. Considering he’ll make $500K or less, that means plenty of surplus value for the Pirates. There is little question about McCutchen’s bat. At .365, has the best wOBA among center fielders in the past two seasons. There’s not much more to say than that. The only question is of his glove. Scouting reports glow, but his UZR is in the tank, -15.7 for his career. If he can reverse that negative UZR trend in 2010, he could rank among the league’s WAR leaders. Twenty-year-old who produce 5-WAR season will by definition provide immense surplus value. He’s at a bit of a handicap, since he plays right field. That means a negative positional adjustment, but Heyward more than makes up for it with his bat and his glove. Another 5-WAR season would give him nearly $40 million in surplus value for his first two seasons. The scariest part is that it’s completely conceivable that he produces more than 5 WAR in 2011. In terms of surplus value, there might have been none better than Evan Longoria. During his first three years he produced nearly 20 WAR — third most in the majors — while making under $2 million. He’ll now hand the reins to the newest crop of youngsters, headed by McCutchen and Heyward. There will be others, too, who put up big numbers during their pre-arb years. But good as they might be, I’m not sure they’re going to top Longoria at less than $100K per win. We hoped you liked reading The New Bang For Your Buck Players by Joe Pawlikowski! Can John Thorn Finally Erase Abner Doubleday? Is it possible McCutchen’s UZR is messed up due to that weird Pirates shift they have going ? SSS and all, but his Away UZR was -2.8 (close to average), but his Home UZR was -25.3, or close to horrible. Maybe after adjusting for the shift, his UZR goes back to average? I’ve talked to MGL about outfielder positioning in the past. Basically, a weird shift ‘should’ still cancel itself out as the player catches balls that he otherwise should not have and misses balls that should have been gimme’s. It’s still possible for a shift to cause those massively negative numbers, but that would mean that it’s a terrible strategy.